Crazy 8 Kids Jeans Only $8.88! – Everything Your Mama Made & More! Crazy 8 Kids Jeans Only $8.88! I love to sew, but one of the things I just don’t have the time or desire to sew for 5 kids is JEANS. I do occasionally make some but honestly we just need to many, lol. I often get asked where I get my kids jeans, especially affordable slim size jeans. Our go too, Crazy 8 (Gymboree’s sister company), is offering jeans at $8.88 and free shipping on all orders over $50, now through Sunday 10/26! Many of the jeans included come in slim, regular and husky/plus sizes for sizes NB-14. And if you have a 20% coupon, including the one they send out for new customers signing up for their email list, it can stack! The dark jeans hold up better then the real light ones. For this price I buy the next size up so I know I am ready for the next growth spurt! These have been the majority of our jeans since the twins were 2 and they are now 7, so 5 years and they have held up very well especially considering the price. I will stick to sewing cute tops and dresses and buying jeans for now ;). After a 20% coupon the $8.88 jeans are just $7.11 each! With a 20% off coupon I just got a total of 31 pairs of Jeans & Sweatshirts for my 5 kids (half will fit now, half are the next size up for spring) for $228 + tax. Not to shabby, cheaper then Walmart and better quality! Don’t forget to share this with your friends! 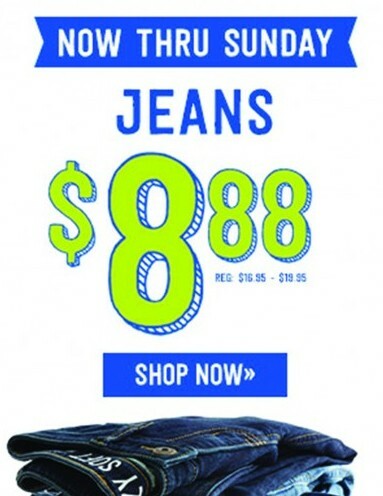 $8.88 jeans + free shipping on orders over $50 at Crazy 8!